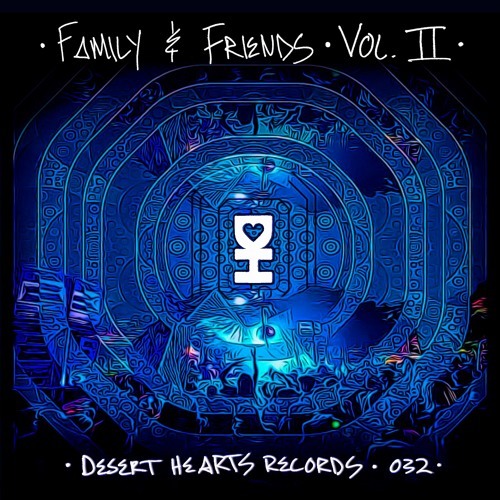 Possibly the world’s hottest up-and-coming record label and music collective, Desert Hearts, released their Family & Friends Vol. 2 compilation last week. And booooooy is it a doozie! Desert Hearts is the perfect example of a fun community culture that embraces upfront House music and shares that wealth with its fans. Desert Hearts’ dedicated following has grown organically over the years and it’s a result of crisp House and Techno productions, amazingly fun live shows, and one of the most-talked-about underground music festivals in the world (Desert Hearts Music Festival takes place this year from April 27-30 and tickets go on sale tomorrow). Family & Friends, Vol. 2 features 14 tracks of Tech-House perfection. The compilation embodies the driving-House tracks we’re used to hearing at Desert Hearts shows and features artists from their network who are poised to be the next big things. Personal favorites of mine from the compilation, in no particular order, include RYBO & Fritz Carlton’s “Disconnect” which combines Disco and Tech-House into a beautiful concoction, Eyes Everywhere’s “4am at the Pink”, Joluca’s “Danger Zone”, and Chuck Iverson, Emuh, and Zof’s “Greed”. But of course every track on the compilation has it’s own heat and flavor for your listening pleasure.